Monkey Mania Video Slot Review - Casino Answers! 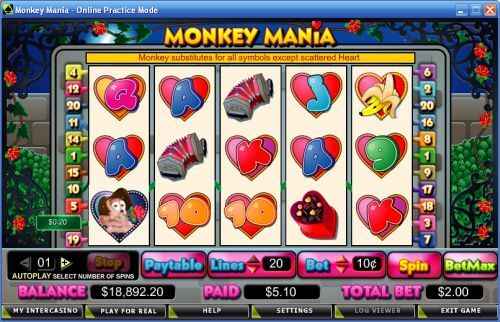 Monkey Mania is a 5-reel, 20-line video slot developed by Cryptologic, featuring a wild substitute symbol, scatter wins and a bonus game. You can play the Monkey Mania video slot at [Americans: Unfortunately due to legal restrictions you are unable to play at any of the online casinos this game is at. We recommend you trying playing the unique slots at Win A Day Casino instead.]. Bets on the Monkey Mania slot machine are $0.01, $0.05, $0.10, $0.25, $1, $2 and $5 per line. You can select up to 20 paylines. You can bet anywhere from a penny per spin up to $100 per spin on the Monkey Mania slot game. Monkey Mania has a good betting range that is suitable for casual players and high rollers. You can play the Monkey Mania video slot by using the “Spin” or “Bet Max” buttons. The Macho Monkey symbol is the top paying symbol on the Monkey Mania slot game. If you land 5 Macho Monkey symbols on a selected payline, you will win the 5000 coin top jackpot. The Macho Monkey symbol is wild and will substitute for all symbols except for the Scattered Heart symbol. The Banana is the next highest paying symbol, which will pay up to 1500 coins. Hit these jackpots to win lots of cash at [Americans: Unfortunately due to legal restrictions you are unable to play at any of the online casinos this game is at. We recommend you trying playing the unique slots at Win A Day Casino instead.]! Payouts are made according to the Paytable. Payline wins are multiplied by the bet per line. Scatter wins are multiplied by the total bet. Scatter wins are added to payline wins. Scatter wins are paid independent of lines selected. Highest win only on each selected payline. Coinciding wins on different paylines are added. All symbols pay left to right only in consecutive order, except for the Scattered Heart symbol (which pays any). Monkey Mania has a basic autoplay mode. To use it, press the “+” and “-” buttons to select from 1-99 autoplay spins on the Monkey Mania slot game. You can begin the autoplay mode by pressing either the “Spin” or “Bet Max” buttons. You can cancel autoplay at any time by pressing the “Stop” button. Monkey Mania has a cute theme that animal lovers and romantics can all enjoy. A minor gripe we have is the title of the slot doesn’t allude to any sort of a monkey romance. You can play the Monkey Mania video slot when you sign up and make a deposit at [Americans: Unfortunately due to legal restrictions you are unable to play at any of the online casinos this game is at. We recommend you trying playing the unique slots at Win A Day Casino instead.]! 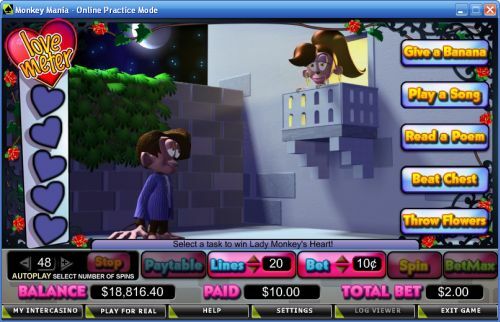 Can USA players play the Monkey Mania online slot for real money? Players from the United States cannot play the Monkey Mania video slot for real money at this time. However, you can monkey around by playing the Funky Monkey Video Slot at Bovada. Where can I play a flash game of Monkey Mania Slots? You can play a flash game of Monkey Mania at [Americans: Unfortunately due to legal restrictions you are unable to play at any of the online casinos this game is at. We recommend you trying playing the unique slots at Win A Day Casino instead.] for real money only. If you experience any issues or difficulties with the Monkey Mania flash game, we recommend downloading and installing the newest version of Adobe Flash Player.